Just a few photos from the workshops that I taught last month, at the Morgan Conservatory in Cleveland, OH. I had a great time at the Morgan, as usual. 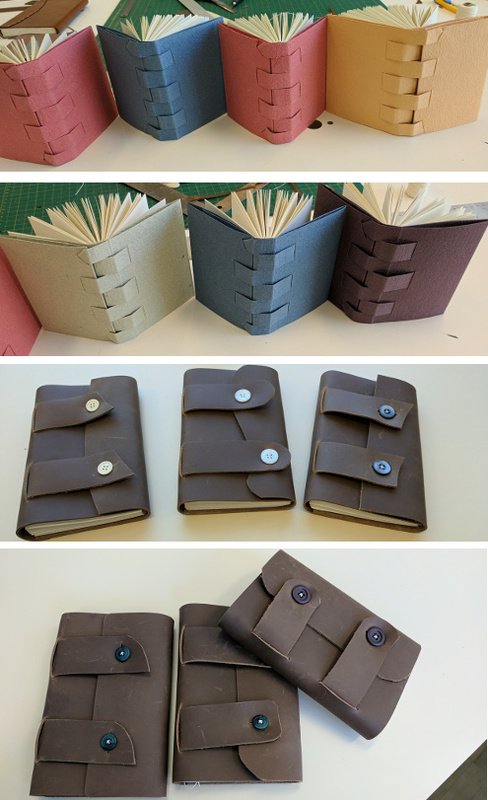 First, I conducted a miniature bookbinding workshop with a dozen participants. 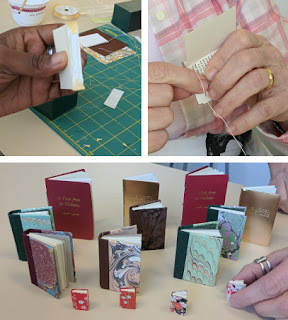 Everyone made at least three different kinds of miniature books. We started with a pamphlet stitch, binding a little copy of A Visit from Saint Nicholas or A Model Millionaire. Then we all made a really tiny blank book, about 20mm tall. We finished by each binding a copy of Kipling's tale of How the Leopard got his Spots, as a miniature hardcover book. Certainly a very productive workshop for everyone. The second workshop was making two different Crossed Structure Bindings. We made the first structure with a paper cover (using lovely Sainte-Armand handmade paper). The second structure was made with a leather cover. The students' previous experience ranged from some who had never made a book before, up to folks with years of experience. These are wonderful and versatile bindings so I hope they will all try these bindings again in the future!